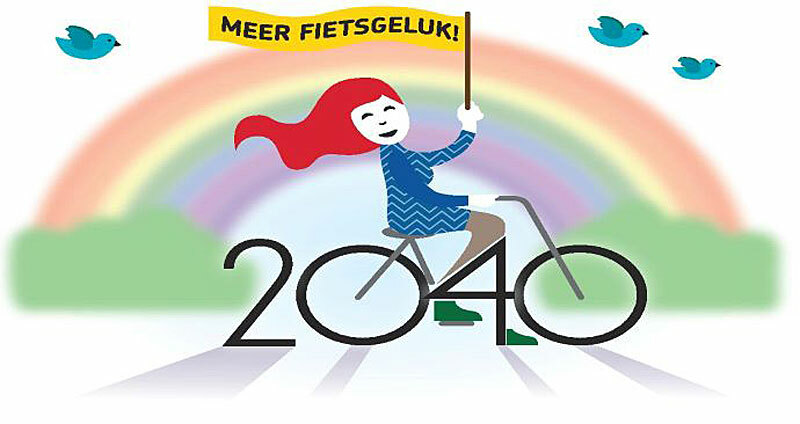 The Dutch Cyclists’ Union (Fietsersbond) has created a Cycle Vision for 2040 with dreams, ideas and wishes for a cycle friendly society in 2040. Last February the active members discussed about the final draft at a meeting in Utrecht and then voted on it. A fundamental question needed to be answered first: “Who are the people the Cyclists’ Union represents and what type of bicycle do they ride?” To make that more concrete, the Cyclists’ Union introduced a new concept: the Cycle Family. 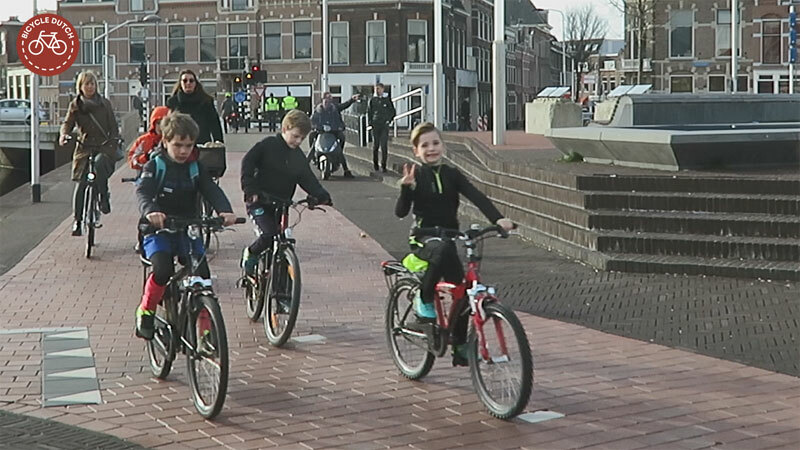 A cycling family in Delft. The boy makes the peace sign. Cycling is peaceful and you can ride in freedom in Delft, thanks to the dreams in the late 1970s and early 1980s to make this city more cycling friendly. That was 40 years ago. The current plan looks “only” twenty odd years ahead. 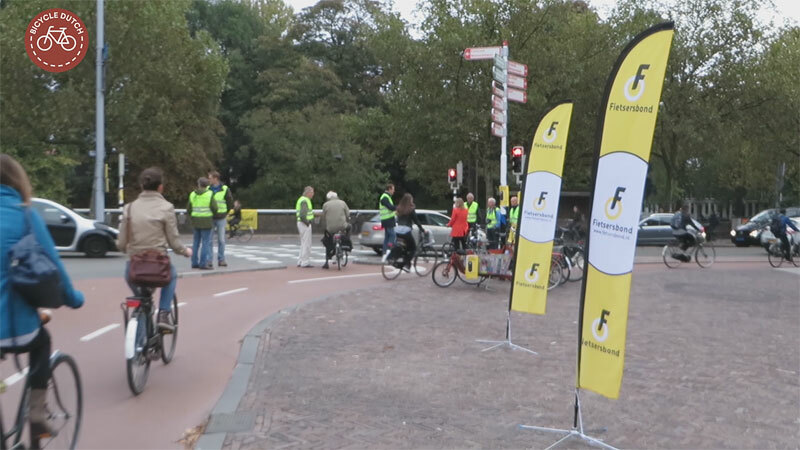 The Fietsersbond (Cyclists’ Union) is firmly committed to making safe and comfortable cycling possible, thus attributing to a more livable, healthier and more active Netherlands and to creating cycling happiness for all. Mission statement, established at the member meeting of 2 February 2019. Prior to the important meeting that would lead to a vote about the Vision and its implications, I gave a presentation. My rich video archive contains ten years’ worth of images of people cycling on all sorts of bicycles. So it was easy for me to visualise that Cycle Family. The notion of the Cyclists’ Union representing all those very different people and types of bicycles is quite a step for some in the organisation. But the time that we only had two-wheeled bicycles in a men’s or ladies’ version is long over. A protest organised by the Utrecht chapter of the Cyclists’ Union in 2014. The Cyclists’ Union was founded in 1975 and has been looking after the interests of cycling for 44 years now. Starting as an advocacy group the Union now has about 35,000 members and more than 1,500 active volunteers in 150 local chapters, who are actively working for (even) better cycling in the Netherlands. The Union has evolved from a group of activists into a respected advisory board to answer all possible questions from many municipalities regarding cycling and cycle friendly infrastructure. But the Cyclists’ Union wants to be more than just a cycling infrastructure knowledge base. After all, cycling is not a goal in itself, it is a means to live your life comfortably. The Cyclists’ Union has a vision for a better Netherlands in which the bicycle can be seen as a happiness machine. “In 2040 the Netherlands will have been designed in such a way that people can choose from multiple cycle routes that would require more or less effort and would offer more or less diversion. Would you rather cycle in a green environment or through the city, with a lot of other people or perhaps almost alone? Anything is possible. Cycling still requires some exercise, but for those who need to go far or those who can only make a limited effort, there are means to help. Impediments that would constrain the freedom of cycling are unwanted, there will be no helmets, number plates or hi-vis clothing. Saskia Kluit, gives a copy of the Cycle Vision 2040 to a politician in the northern province of Friesland. The vision also carries a manifesto to become more diverse in ages and cultural background. The Cyclists’ Union would like to have fewer barriers for people to come and help out. It is easier for people to join a club when they find members from their own age group and background. The webpages about the Cycle Vision 2040 are – so far – only available in Dutch. Video with my view of the Cycle Family in the Cycle Vision 2040 of the Cyclists’ Union. When I bicycle in the US it’s completely different. It’s ok but not fun. It’s more of a workout. I believe The Netherlands has the effect on me due to the mostly very flat land, extensive user friendly bicycling infrastructure, bicycles that are made for the flat land, the way built up areas and open space is laid out, interesting, diverse and good tasting foods, accessibility by bicycle almost everywhere, good natured people, a climate without extremes and the safety of the country in general. Many people probably think about cycling infrastructure in terms of spending taxpayer money. However, it must be a significant positive boost to the Dutch economy in terms of jobs and income for the companies involved. Does the Dutch Cyclist Union talk about these economic benefits both now and in the future? Yes they do. There is a great return of investment on cycling infrastructure. So it is wise to invest in cycling for a great number of reasons, economics being one of them. This entry was posted on 3 April 2019 by Bicycle Dutch in Original posts and tagged bicycle culture, Cyclists' Union (Fietsersbond), small things.